A couple weeks ago, during my visit to Anaheim, CA for the D23 Expo, I was also able to visit one of my favorite places to be... the World of Disney Store at Downtown Disney! 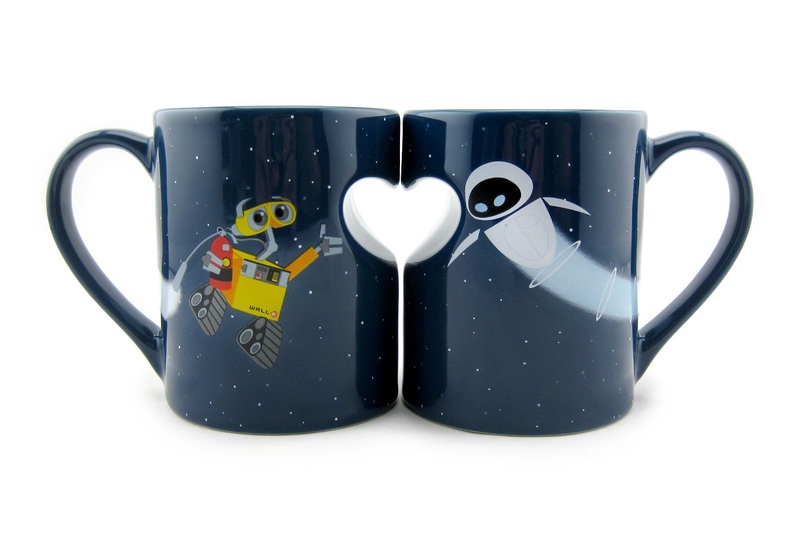 As I was casually meandering through the store looking for anything unique and Pixar related, suddenly I saw this incredible Wall·E and Eve mug set. I think I even did a double take and gasped! I was thrilled since I hadn't seen this before (or at least I had forgotten about it). It's not too often that a great piece of Wall·E merch gets release. This mug set captures perfectly one of the most beautiful scenes in Pixar history: the film's "define dancing" sequence. Wall·E and Eve twirling through the stars to Thomas Newman's gorgeous score has to be one of my top personal Pixar moments of all time. 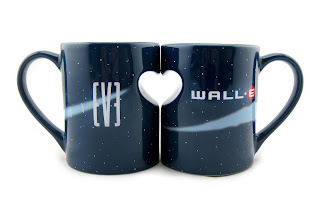 How cool is it that these mugs form a heart when placed next to each other? That's what really sold me; but I also love the art/style of the both characters on the front of their names on the back. Lets take a better look at them out of the package! 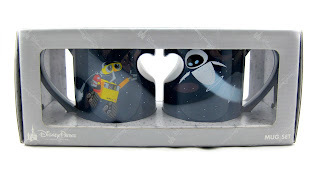 The mugs are ceramic, are 3 1/2'' H x 4'' Diameter in size and hold about 12 oz. The set retails for $24.95, which I thought was a really reasonable price. This set is a Disney Parks exclusive. 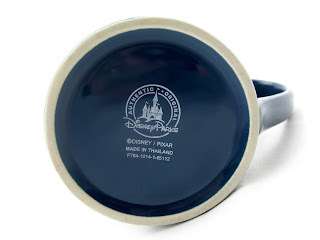 Like I mentioned, I found it at the World of Disney Store in Anaheim, CA, but I'm sure it's also available elsewhere. I'm guessing you can find this throughout all the Disney Parks in both CA and FL as well. Definitely be on the lookout! If you're a big Wall·E fan, than these are a must have. You can also find this online HERE and on eBay HERE.